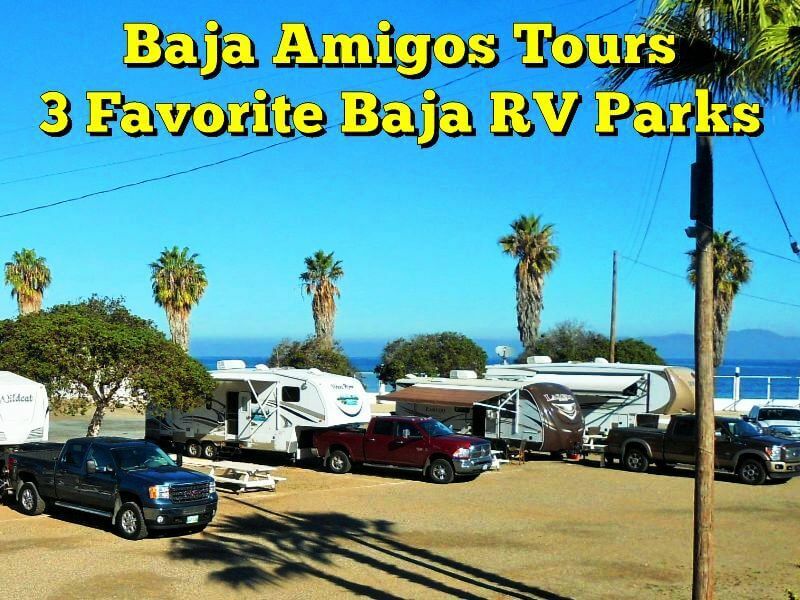 There are over 350 RV Parks in Mexico, including dozens on Baja and we have three (3) favorites which we frequent on our tours. They are not the most expensive campgrounds in the areas we stay, however we believe you will enjoy them for the same reasons we do. This campground, (on property that has been in the family for decades) is operated by our friends Adolfo and Belem Villarino and we have been staying here since we first scouted it 7 years ago for our tours. 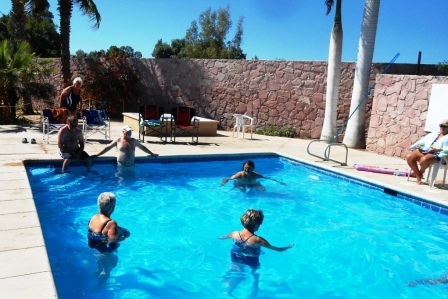 There are many factors that make the Villarino RV Park a good fit for us. Our excursion to La Bufadora, the proximity to the beach (with hot springs), tranquil surroundings, Mini-Market, easy access and all the basics (power, water, sewer, Wi-Fi, showers, washrooms and friendly operators. It’s close enough to Ensenada, (south side) and a little off the beaten path. The beach is clean and safe for swimming. You can see the tide pools teeming with small creatures for explorers to find. The natural underground hot springs are an extra bonus. At low tide with a shovel you can create your own hot tub. A Plexiglas-fronted terrace overlooks the beach and a large grass and gravelled area with some trees with 25 larger sites, mostly pull through. Most have picnic tables, and some have fire rings. You must be careful when maneuvering through the entrance and access road but you will fit, we have had the largest of A Class motorhomes and 41’ 5th wheel trailers into this park. It is also helpful that laundry service, a veterinarian and grocery store is close by. Adolfo speaks English as well as speaks Spanish and has helped us many times with challenges that we have encountered from time to time. The restrooms are very clean and well maintained, and yes the showers are hot. The Mini Market, post office, café and public phone are in front of the campground. There is also a small boat ramp suitable for smaller boats as you must cross the soft beach. They have weekly, monthly and group discounts available. We first stayed here perhaps 8 or 9 years ago. Family owned, this campground has been here for decades now operated by the original owners’ daughter Yolanda and her husband Rick. The park is in a residential area only a few blocks (easy walking distance) from the Loreto business and tourist district, 2 blocks from the beach and not further to the Malecon. Be prepared for barking dogs, crowing roosters, auto noise and early morning garbage trucks. The campground is very busy with RV caravans from Mid-January to the end of February so we suggest you book ahead for a space in this time frame. The owners live on site and are always very friendly and accommodating. It is well-supervised, security is excellent and very clean. This park has 25 back in RV spaces with full hook ups (15 amp) and also a nice tent camping area with shade. These sites vary in length and we have had every size of RV in this campground. There is no doubt this place is tight, we bring in RVs on tour in one (1) at a time, disconnecting any tow’ds before entering. The spaces are narrow with little room for awnings however we always seem to get the slides out. The restrooms are very clean and well-maintained (Rick is a plumber), they are individuals rooms with showers (great water pressure), toilets and sinks. There’s also a laundry area with washers and dryers and also covered patio. Wi-Fi is provided and can often be received in your RV. A couple of years ago a Laundromat opened across the street which has become very popular with the RVers and locals alike, it is quick and inexpensive, the gal who runs it does a great job. Yolanda is very helpful no matter what it is you are looking for from fishing, whale watching too visiting a doctor, just ask. Weekly and monthly rates are available. When we first visited La Paz in 1985 there no less than eight (8) RV Parks, now there are two (2). We were introduced to Campestre Maranatha in 2008 after the closure of Casa Blanca. A version of Campestre Maranatha has been in La Paz since 1959 when Cecil & Faye Byers, Christian missionaries, purchased the property with others and built a home, Bible School and meeting place. This property also served as a runway, the only way into La Paz (other than boat) as the highway was not finished until 1973. Our friends Cindy (Cecil & Faye’s youngest daughter) and Jose Nuñez returned to La Paz and took over the responsibility of Campestre Maranatha in 1999 and have recently completely rebuilt the family home. 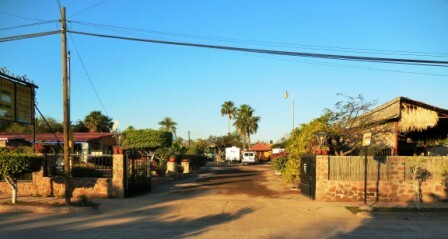 Campestre Maranatha is very well maintained, clean with nice bathrooms, hot showers and laundry facilities. The grounds are meticulously groomed by very friendly staff. It also has a park area, pool, and various park equipment for kids, picnic facilities, meeting area, large fire pit with seating, horse shoe pits, rooms for rent with kitchens and lots of shade trees. There are thirty-seven (37) full-hookup RV sites large enough for 40’s. Each has 30 amp outlets, water and sewer hookups. They are in two locations on the property: 25 new sites in a new lot out front and 12 along the west wall of the property. There are also a few scattered no-hookup sites for dry camping (all back in spots). There’s a coffee shop (Café Exquisito) managed by Cindy’s daughter out front along the highway that offers WiFi internet access (great breakfast & lunch specials). There’s also Wi-Fi at the sites, telephone service to the US in the office and monthly rates are available. Cindy is a great resource for repairs, contacts, services and information. Our groups often use the services of Abby, the laundry angel and bus service into La Paz goes by every 30 minutes for less than a $1 US.